This paper assesses the private remedies available under Rule 10b-5 to retail investors who have been defrauded by false corporate disclosures. 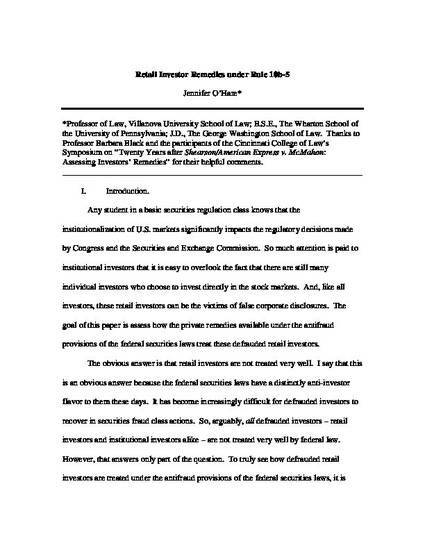 After comparing the treatment received by retail investors to the treatment received by institutional investors, I identify several areas in which the federal securities laws disfavor retail investors who have been defrauded by false corporate disclosures, including the creation of a two-tiered system of investor remedies for securities fraud. Institutional investors are permitted to pick and choose which law and forum offers them the most attractive chance for recovery, but retail investors typically do not have this opportunity. They are forced to sue under federal law in federal court. I then show that disfavored treatment could lead retail investors to question the fairness of the federal securities laws, contributing to a loss of investor confidence in U.S. markets. I conclude by exhorting policymakers to recognize that the securities fraud class action significantly disadvantages retail investors. Policymakers need to become much more aware of the plight of the defrauded retail investor when considering reforms to private securities fraud litigation and when determining enforcement initiatives.